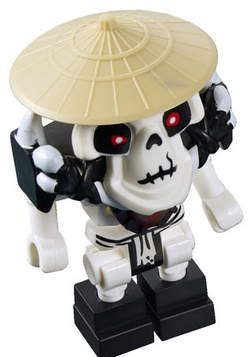 Wyplash is a Ninjago skeleton minigifure released in 2011. He is the skeleton general of ice and appeared in two of the Ninjago: Masters of Spinjitzu mini-movies. According to the official Ninjago site, he has the ability to turn his head backwards. He seems to have gained this ability due to his extreme paranoia. Wyplash wears the same hat as Sensei Wu and black body armour with white spikes. His head is a new mould and has large red eyes. Wyplash has printed nostrils and a mouth with a large crack on the left side. His body is a skeleton body with a white, printed loincloth at the bottom of the piece. His arms and legs are the new ones introduced for the Ninjago skeletons. On the preliminary box for the 2506 Skeleton Monster Truck, Wyplash is called "Monster Truck Driver". His name is mistakenly spelled Whyplash in the mini movies. On his CGI picture he is mistakenly wearing Cruncha´s armour. Wyplash wallpaper. Note the blue cloth, not white. This page was last edited on 13 January 2016, at 00:13.